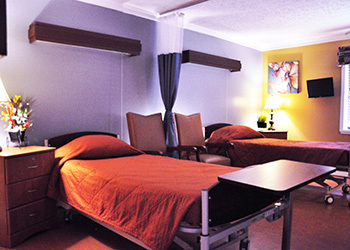 This spacious Rehab Suite features modern decors, soothing warm colors, beautiful dark woods, full electric bed with comfortable support mattress and upgraded bathroom. This suite has a fully equipped kitchen and separate living area with 32” flat screen television. In addition to the above mentioned amenities, the Premiere Private Suite features a large full size bath tub and shower. This spacious Rehab Suite features modern decors, soothing warm colors, beautiful dark woods, full electric bed with comfortable support mattress and upgraded bathroom. This suite has a separate living area with 32” flat screen television.